1Clean the fish and remove the bones and skin. 2Cut into 2 up to 3 cm and season with salt, pepper and juice 1 citroen. 3Mix the flour with cornstarch and cover the fish pieces with this mixture. 4Go through the beaten egg with a tablespoon of water. 5Fry in hot oil until cooked and golden brown. Drain well as they are removed and placed in a paper towel to remove excess fat. 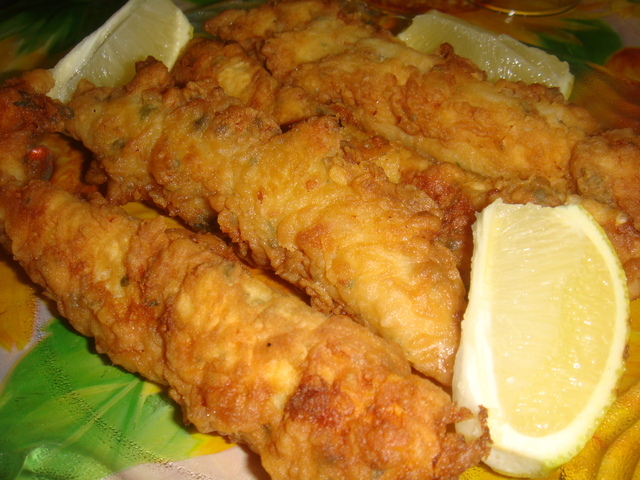 6Serve with tartar sauce and place 1 lemon into pieces of 4 to the side. 1Prepare a classic well-seasoned mayonnaise and then add parsley, pickles, capers and chopped onion.